This volume includes the end of the first arc (Dark Kingdom) and start of the second (Dark Moon). The Dark Kingdom ending is pretty damn epic, lives ruined, bloodshed epic. Usagi finding out not only is Mamoru still alive, but he's now brainwashed for the enemy, her doing everything to get him back, the scouts and Luna going to their limits and beyond to help, and her eventual takedown of Queen Metalia. There's also some great scenes with Venus's sword (which better be in the new series). The Dark Moon arc starts immediately with another bun-headed girl named Usagi quite literally dropping in on our hero. The child hypnotizes Usagi's family and is referred to as Chibi-Usa, or little Usagi. She's searching for the Legendary Silver Crystal (isn't everyone?) and mysteriously appears to have one just like it. 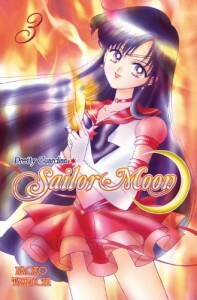 The final two chapters in the volume introduce the Black Moon Family as their most junior members, the Spectre Sisters, begin abducting the Sailor Scouts. By the end of the book, the group is down to three. I did love the chess game between Ami and Berthier in the anime series and was happy to see its roots in the manga.